KB Home (NYSE:KBH) , one of the nation’s largest and most recognized homebuilders, today announced that more than half of the homesites at its newest Raleigh community, Oakwood North, have already been sold since its recent grand opening just a few months ago. Homebuyers are enthusiastic about the community’s highly desirable location surrounded by historic neighborhoods in the heart of downtown Raleigh, as well as the attractive design of its new homes which offer floor plans that can be customized to each buyer’s tastes and preferences. The excitement is shared by local realtors, who are bringing their clients to Oakwood North to showcase the compelling opportunity to own a new home in this unique community before it is sold out. Surrounded by historic landmarks and major city sites, KB Home’s Oakwood North is ideally situated in downtown Raleigh, minutes away from the Capitol building and many renowned museums, restaurants, shops, and cultural attractions. North Carolina State University, Peace College, and Saint Augustine’s College are also very close to Oakwood North, and the community is just a short walk to the Historic Oakwood area. KB Home is offering two-story single-family homes at Oakwood North that range between 1,881 and 2,747 square feet, with up to six bedrooms and three bathrooms. Through the unique KB homebuying experience, buyers at Oakwood North will be able to personalize nearly everything about their home to fit their lifestyle and budget. In addition to selecting their specific homesite, floor plan and structural options, KB homebuyers at Oakwood North can work one-on-one with an expert design consultant at the KB Home Studio who will walk them through the various d’ecor, technology, and sustainability-focused components that can be incorporated into the construction of a new KB home. All new KB homes at Oakwood North will be ENERGY STAR(R) certified and built with an array of water-conserving features such as WaterSense labeled faucets and fixtures. These and other items like radiant barrier roofing, low-E windows and advanced USB outlets that are included as standard in all new KB homes, will allow homeowners at Oakwood North to experience potentially significant savings on their utility bills compared to typical resale homes in the area. KB Home has been happy to serve the Triangle area for many years and is currently open for new home sales at 10 other communities from Wake Forest to Fuquay-Varina, Durham to Clayton, and locations in between. 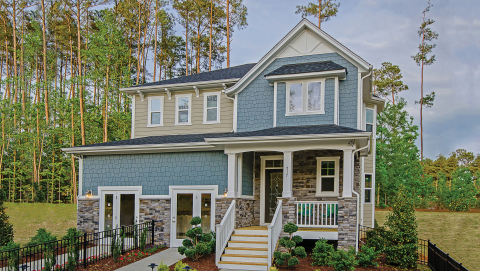 For more information about KB Home in North Carolina or other KB Home communities, visit www.kbhome.com or call 888-KB-HOMES.